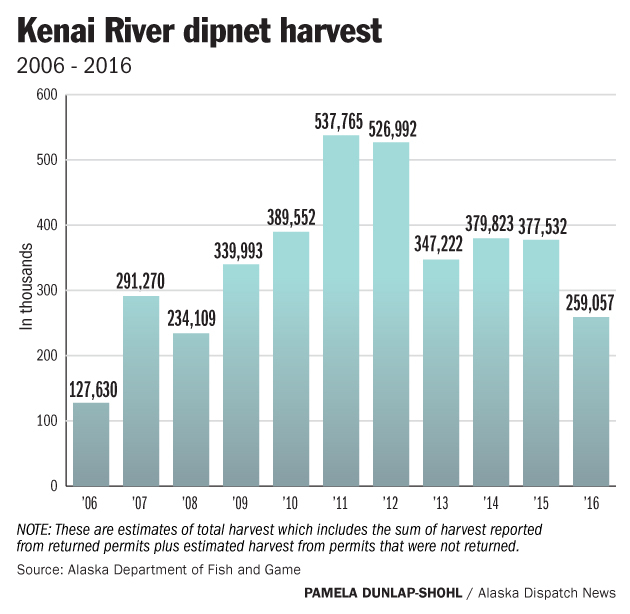 So maybe you've heard that thousands of people head to the Kenai River each year to participate in the personal-use dipnet fishery and you want to join them. Dipping nets in the water to catch a salmon looks easy, right? While it's considered a more effective catch method than rod-and-reel fishing, dipnetting comes with its own challenges and complicated rules. Over the last decade, the Kenai fishery has averaged a harvest of about 350,000 sockeyes annually among about 30,000 permit holders. That makes it the most-popular fishery in Southcentral Alaska and one conveniently located near the cities of Kenai and Soldotna, making for an easy trip for many living in the region — and well within reach of Anchorage and Mat-Su residents. Thousands of Alaskans also flock to the Chitina personal use dipnet fishery to the north, particularly Fairbanks residents. But come July, Southcentral fish wranglers focus on dipnet fisheries on the Kenai and Kasilof rivers and Fish Creek outside of Wasilla. Whether 2017 will be a banner year for Kenai sockeye remains to be seen. This year, 4 million sockeyes are expected to return to upper Cook Inlet, according to the Alaska Department of Fish and Game — 1.2 million below the 20-year average. The returns of both the 4-year-old sockeye last year and the abundance of fry in Kenai and Skilak lakes were below average, according to Fish and Game research biologist Mark Willette. On the Kenai River, 2.2 million sockeye are forecasted to return, well below the 10-year average of 3.6 million fish. But if you decide to fish, here's what you need to know if you want to fill your freezer. 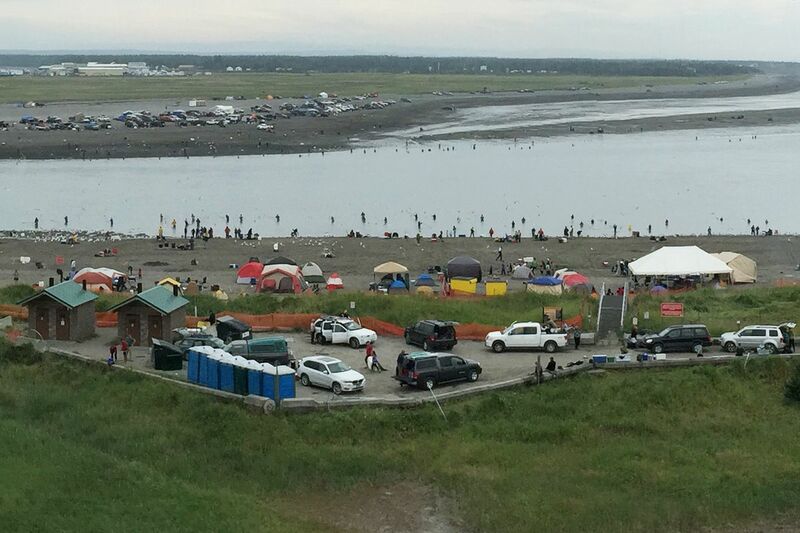 The Kenai River personal-use fishery opens Monday, July 10, and closes July 31. Dipnetting is open 6 a.m. to 11 p.m. daily, regardless of the tides. The Kasilof River fishery opened June 25 and will run until Aug. 7 and is open 24-hours a day. Fish Creek opens only if Alaska Department of Fish and Game managers project the run will exceed 35,000 fish. The fishery has been open only five times since 2009. Historically, the peak of the Kenai run is July 16-25. However, fish can come any time. 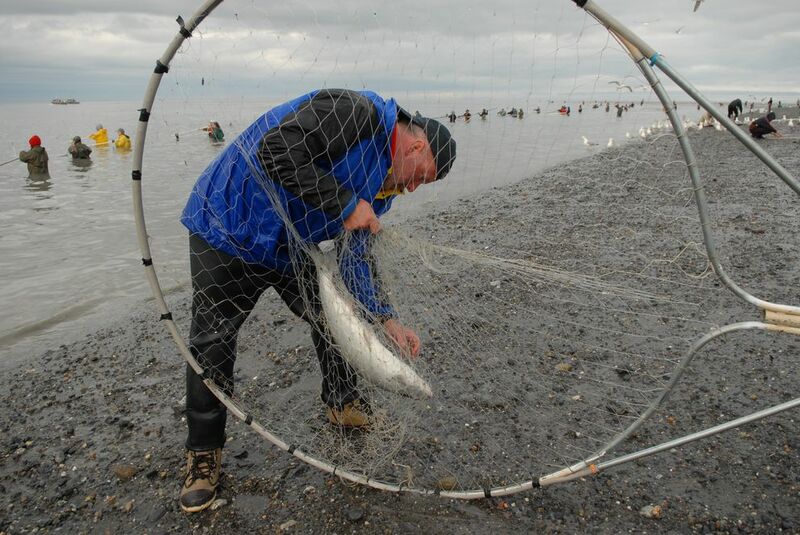 Fishermen can check the Kenai River late-run sockeye counts online. Typically, optimal dipnetting days are when 50,000 to 100,000 fish head upriver, but note that the fish counting sonar is 19 miles from the mouth of the river, meaning the fish have already passed the dipnet area. Check the tides, too. Sockeye generally move with the current, so fishing is best a few hours before high tide and few hours after. Avoid fishing slack tides. The city of Kenai launched a free "Dipnet Kenai" app this year that shows weather, tides, fish counts and even webcams. Kenai City Manager Paul Ostrander said those webcams can be a good way to check how busy the fishery is and whether people are catching anything. The webcams are also available online without the app. The annual personal possession limit is 25 sockeyes per head of household, and 10 more for each additional member of your household as well as 10 flounder, one Kenai king salmon more than 20 inches in length, and 10 kings smaller than that. The total applies to all Cook Inlet dipnet fisheries, so you cannot score one limit in the Kenai and another on the Kasilof. However, fish caught in the Chitina personal use fishery do not apply to the total. King salmon may not be kept in the Fish Creek fishery. The limit applies to the whole length of the fishery, meaning an individual cannot catch 25 fish one day and 25 another. Just 25, total. Is everyone allowed to dipnet? No. Only Alaska residents with a resident sportfishing license can participate in the fishery. Fish and Game considers a resident someone who has lived in the state for 12 consecutive months. Military members who have been stationed in Alaska for at least a year can also fish. While military stationed here for less than a year are eligible for a discounted nonresident sportfishing license, they are not allowed to participate in the personal use fishery. A dipnet is a bag-shaped net attached to a rigid frame. That frame can be no more than 5 feet at its widest point, and the bag must be at least half the width of the frame The webbing can be no more than 4.5 inches stretched. Beyond that, size and shape is up to the fishermen. You can buy nets at sporting goods stores and Costco, or make one yourself. Some dipnets are square, others round. The frames can be metal or plastic. Some have long handles, others short. It's all personal preference. Stick the net in the water, perpendicular to the riverbank, with the current running through the net, and wait. When you feel a tug on the net, flip it to "trap" the fish and pull the net to shore or onto the boat. Stun the fish, bleed it (typically by cutting the gills) and clip the tail fins before storing the fish out of view. Does the commercial fleet affect my dipnet catch? The short answer is yes, according to Pat Shields, Fish and Game Soldotna commercial fisheries area biologist. However, the impact of the commercial fisheries on the personal use fishery can vary depending on a variety of factors, including how many fish are running and when the commercial fleet is allowed to fish. He said the drift fleet, which people often point to as a problem on slow fishing days, fishes 40 to 50 miles from the mouth of the Kenai and doesn't affect fishing on the Kenai for several days. 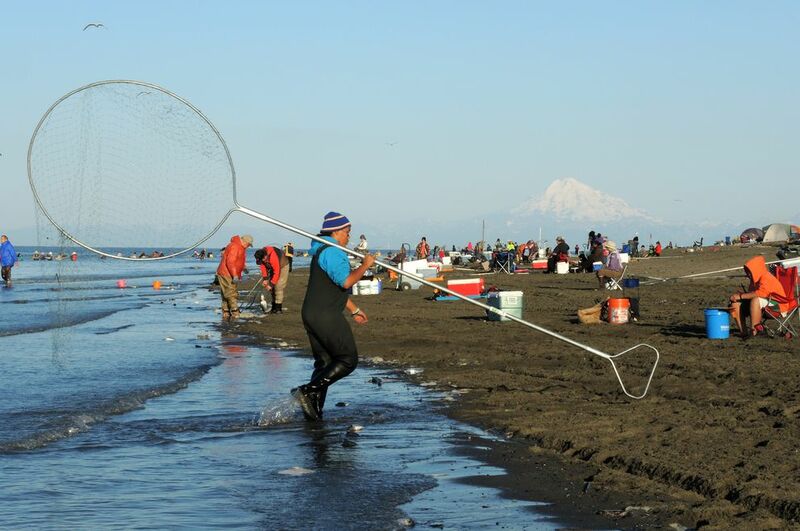 The setnet fleet, which fishes on the banks of Cook Inlet just a few miles from the dipnet fishery, can impact fish runs three or four hours after they begin fishing. Shields said the commercial fleet is tied to strict management plans based on escapement goals for the river. The fleet must fish in order to prevent over-escapement in the river. Still, he said, when the fish run, they run. Some of the biggest days counted on the Kenai River sonar have coincided with commercial harvests. I have friends and family from out of state visiting. Can they dipnet with me? Unless they only watch, no. Rules on nonresidents participating in the fishery are strict, according to the Alaska Department of Fish and Game. Not only can they not fish, but they are not allowed to assist in the fishery in any way, from carrying nets and coolers down to the beach to driving boats. Those caught assisting can face a series of fines depending on the infraction. At the most basic level you need only a few things: a resident sportfishing license, a free dipnetting permit and a dipnet. The dipnetting permit is available online or at sporting good stores and some gas stations. The fishing license and permit must be carried with you while you are fishing. Of course, you'll need more than that. Other basic items include waders and boots, a cooler with ice to store fish, and a fillet knife or kitchen shears for clipping fins. Does it cost money to dipnet? Beyond gear, gas and food, a sportfishing license costs $29. Dipnet permits are free. 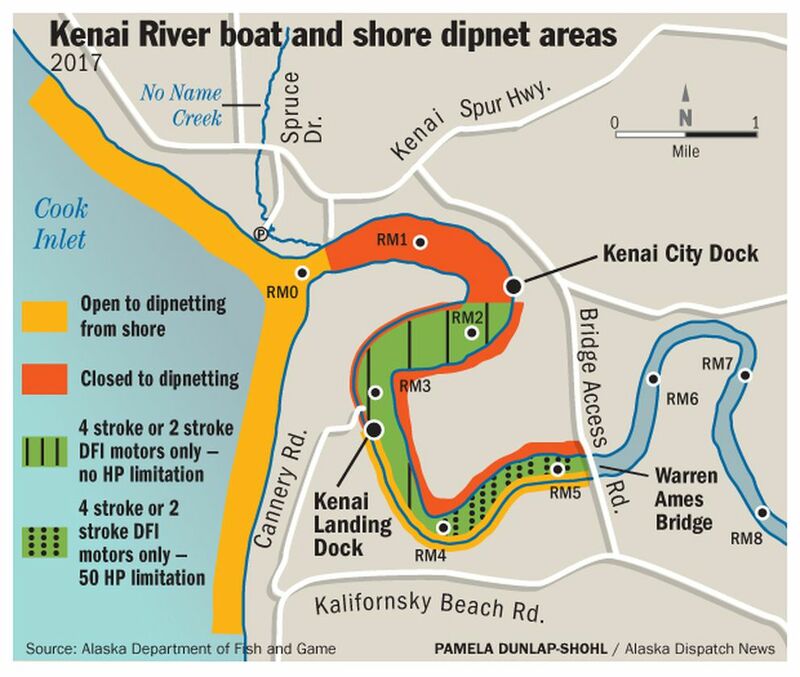 To access the Kenai River dipnet fishery via the north and south beaches, visitors pay additional fees. Those range from $10 for a daily dropoff pass to $55 for overnight camping and parking. For a list of fees, go here. Why are some people doing it from boats? Some people consider this method of dipnetting easier and more effective than fishing from shore. Boats can move through the river faster, covering more ground and potentially targeting more fish. It's also physically easier to haul in the fish since you only have to pull the net into the boat instead of onto shore while fighting the current. However, it requires a boat. Only boats powered by four-stroke, two-stroke direct fuel injection, or electric motors are allowed in the personal use dipnet fishery, and only in the vessel-designated portions of the river. These areas are, generally, closed to dipnetting from the shore except in designated areas. Most people put fish in a cooler on ice. Before you put the fish out of sight, you must clip the tail fins. This is in order to separate fish caught in the personal use fishery from fish caught in the commercial and sport fisheries. Dipnetters generally gut fish before leaving the fishery, but some elect to head, gut and fillet fish before leaving the beach. If so, carcasses can be deposited in the water close to the shoreline. Local processors also will fillet and vacuum-seal fish for a fee, usually calculated per pound of fish. Can I sell my fish? While you can give it away, it's illegal to sell or barter fish caught in the personal-use fishery.